With the rising popularity of cryptocurrencies, blockchain technology has become one of the hottest topics this year. Though we typically hear about its applications in financial services — more than $6.3 billion has been raised through initial coin offerings (ICOs) in the United States alone – blockchain technology has started to transform many other industries, from voting to cloud computing to advertising. With this spike in popularity, blockchain-related jobs are the second-fastest growing in today’s labor market. Like AI, blockchain has the potential to revolutionize all types of sectors, but most of us are still unfamiliar with the technology, how it might impact our daily lives and the benefits that come with it. That’s why we’re excited to team up with ConsenSys, the leading venture production studio building decentralized applications and tools for Ethereum, to launch Blockchain: Foundations And Use Cases. This foundational course is designed to give anyone in the world—curious individuals and professionals alike—an introduction to this increasingly popular next generation technology. Course learners will get the knowledge and skills they need to understand blockchain’s impact on the world and identify problems to solve using blockchain in their domain of expertise. This first-time offering with Coursera is an opportunity for non-technical learners to add blockchain knowledge and enhance their professional skill set. ConsenSys Academy has a track record of successfully training students and continuing to facilitate opportunities following graduation; ConsenSys Academy’s inaugural Developer Program graduated 55 students, 35 of whom joined ConsenSys as employees. The current cohort of online developers has close to 900 students, 200 of whom are being considered for employment in the Ethereum ecosystem. 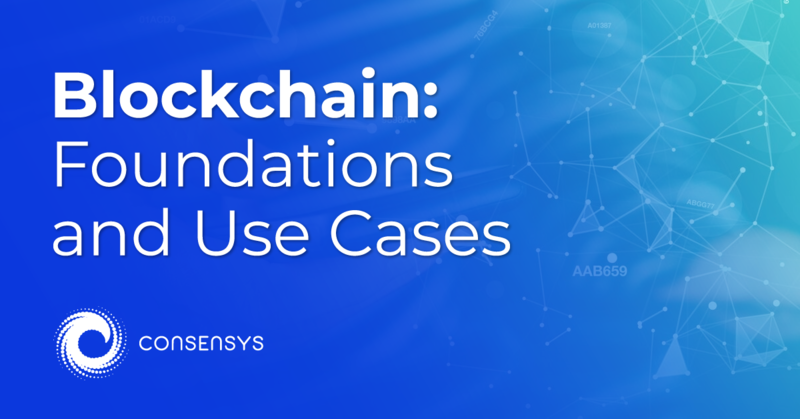 For more information, visit the Blockchain: Foundations And Use Cases to learn more and sign up today.